John George Griffin was born on 4 March 1846 at Richmond, Victoria, son of John S and Emma C Griffin. In 1869 in Victoria he married Martha Woolley. He died at Rockdale, Sydney, on 26 August 1923. Griffin was educated at public schools in England and Europe. He was articled as a civil engineer with the Great Western Railway Company in England and worked on railway construction and surveying in Bulgaria (then Turkey) and Romania. In 1867 he returned to Australia. He passed the Victorian licensed surveyors’ examination and municipal employees’ examination and was appointed engineer at Portland, Victoria. He came to Sydney about 1883 and passed the NSW licensed surveyors’ and engineers’ examinations. By 1910 he had premises at the Equitable Buildings, 350 George Street, Sydney. He was a member of the Local Government Examination Committee and was the only life member of the Local Government Association. He was a member of the Pioneers’ Club. 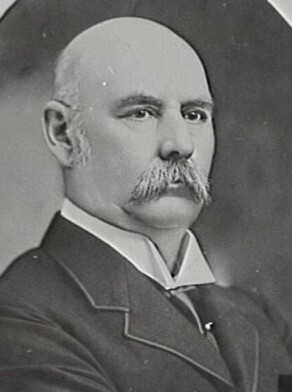 John George Griffin had considerable local government experience and served as Mayor of Manly, Hurstville and Bexley Councils. Griffin was Alderman for Cook Ward, 7 December 1900 to 30 November 1904, 7 December 1905 to 30 April 1906, and 1 December 1909 to 30 November 1915. He was a member of the Works Committee, 1901-06 and 1915, and the Health and By-Laws Committee in 1901 and 1910-15. He was a member of the Electric Lighting Committee, 1901-02, 1904-06 and 1911-1913, and the Finance Committee, 1903-04, 1906 and 1914. He belonged to he Parks and Recreations Committee in 1903 and the Queen Victoria Building Special Committee, 1910-11. He represented the Council on the Metropolitan, Water and Sewerage Board for 23 years from 1900 to 1923.